When I started this blog last May, I had NO IDEA what I was doing. I didn’t know how to get readers that weren’t family members, I wasn’t sure if this was a mommy blog or a breast cancer blog, and I couldn’t find other bloggers that were like me. Clicking on the “next blog” at the top of Blogger didn’t help me; most of the blogs I found were in Portuguese or German. I read the well-known bloggers, like Dooce and Suburban Bliss, but they were no help. I don’t remember exactly how it all panned out, but I think I found abdpbt advertised Dooce and then…I discovered something big! Anna hosts “fighting listlessness Monday” where she will link up bloggers who write a list. I started clicking, started reading, started commenting, and starting writing…and somewhere along the way, people started reading my blog! I felt like I had broken the code. And now, Peggy from over at Stir Crazy in the Suburbs passed this award on to me, and I’m thrilled! Thank you, Peggy! My life with my family and friends by my side…I have so much to look forward to! I had a hard time picking seven blogs…. I love reading so many of them! 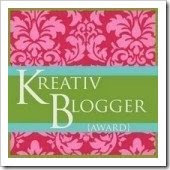 Here are seven bloggers I am passing this award on to; I have been readings some of these blogs for a while, and some are new to me. Ginger at When Ginger snaps…. Part of the fun of award posts is reading new blogs! If any of those names are new to you, start clicking and reading!